As states like Mississippi reject solitary confinement, this “blue” state leads the nation in the use of “disciplinary segregation.” Or as prisoners call it: torture. 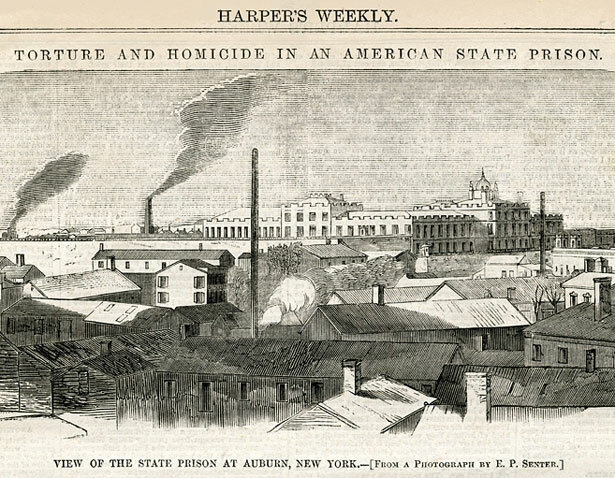 An illustration of Auburn Prison from Harper’s Weekly, December 18, 1858. Johnny Tremont’s trip to solitary confinement started with having too many postage stamps. Until then, he’d been a model prisoner. When Tremont (whose name in this article has been changed at his request) entered the New York prison system at age 20, he was a well-spoken kid from an upstate college town who excelled at pretty much anything he put his mind to. In high school, he’d put his mind to dealing cocaine. Once he was sent to Five Points Correctional Facility, a maximum-security prison in the Finger Lakes region, he put his mind to keeping his nose clean and getting what he could out of his fifteen-year sentence. He enrolled in every program available, quickly earned his GED and then started tutoring other prisoners working toward theirs. “The Box” is how New York prisoners refer to solitary confinement. Less colloquially, it’s the SHU (pronounced “shoe”), for Special Housing Unit, the state’s euphemism for its isolation cells. Officially, New York places prisoners in “disciplinary” or “administrative” segregation, but regardless of the label, the conditions are the same as in prisons across the country: twenty-three hours a day in a cell the size of the average suburban bathroom. A common misconception is that solitary confinement is a punishment of last resort, reserved for inmates who present a threat of violence or escape. The reality—especially in New York, which has the highest rate of “disciplinary segregation” in the country—is that it’s very much a punishment of first resort, doled out for minor rule violations as well as major offenses. In New York, the most common reason for a stint in solitary is creating a “disturbance” or “demonstration.” This can mean anything from mouthing off to guards to fomenting a riot, and it often involves inmates with psychoses or other psychiatric problems. Second is “dirty urine”—testing positive for drugs of any kind. In a prison system where 85 percent of inmates are in need of substance-abuse treatment, drug use alone can get you up to ninety days in solitary, and a year if it happens multiple times. Other infractions include refusing to obey orders, “interfering with employees,” being “out of place” and possession of contraband—not only a shiv but a joint, a cellphone or too many postage stamps. New York abandoned the practice of “absolute solitude,” as Tocqueville and Beaumont called it, only to resume it a century and a half later, with none of the spirit of inquiry that informed the Auburn “experiment.” Today the little research that exists supports their conclusions: that solitary confinement can lead to madness and suicide, and that it tends to increase both prison violence and recidivism. States that have dramatically reduced their use of isolation have seen improvements in the safety of inmates and staff. Why, then, does “liberal” New York have one of the nation’s highest rates of solitary confinement? And why have these levels persisted, even through years when the state’s prison population—and crime rate—have dropped? In fact, it was New York’s liberal Republican governor, Nelson Rockefeller, who passed the harshest drug laws in the country, and it was his Democratic successor, Mario Cuomo, who began building prisons to hold the resultant twofold surge in the state’s inmate population. Under President Bill Clinton, the federal government offered states generous funding for prison construction if they agreed to reduce or end parole for violent crimes. New York complied, using much of the bounty to construct “supermax” prisons and isolated confinement units. Ten of New York’s eleven facilities dedicated exclusively to holding prisoners in lockdown were constructed between 1997 and 2000, according to the Correctional Association of New York, an independent nonprofit with the legislative authority to monitor New York’s state prisons. And they were built despite the fact that, by 1996, violence levels in the prison system had already begun to drop. In the past decade, New York’s prison population has decreased by nearly 10,000, to approximately 56,000. In the same period, the number of prisoners in isolated confinement has fallen from about 5,000 to 4,500. But this means the proportion of prisoners in lockdown has actually increased slightly, to just over 8 percent. New York maintains two supermax prisons where all inmates are in lockdown (although it eschews the term “supermax”). Most others have some kind of segregation unit. What these various manifestations of the Box have in common is that they combine near total cell confinement with extreme social isolation and enforced idleness, since prisoners in lockdown are not allowed to work or attend programming. They are also categorically barred from visits by the media (including us) and invisible even to many prison authorities. Prisoners who contest their treatment risk retaliation in the form of more Box time, and those accused of violating rules inside the Box are further punished with more time or “deprivation orders.” These can include shackles, loss of recreation time and showers, or seven days or more on “the loaf”—described by one advocacy group as “a dense, binding, unpalatable one-pound loaf of bread and a side portion of raw cabbage.” A Correctional Association survey of SHU inmates found that nearly one-third of them had been put on the loaf—one for fifty-six days. The New York State Corrections Department has denied that unwarranted use of force routinely takes place in the SHU. And one former guard, who worked for more than a decade at several upstate prisons, told us that “any officer who has worked in the SHU doesn’t look for altercations, because they happen all the time” and are initiated by the prisoners. He points out that corrections officers sustain abuse and injuries themselves, often at the hand of inmates with untreated mental illness. Like most who have guarded the SHU, he recalls being frequently cursed, spat upon, even spattered with urine and feces. He also suffered broken bones while trying to subdue a prisoner there. At the same time, nearly every one of the dozen inmates we spoke or corresponded with reported experiencing some form of abuse while in segregation. Several said that racism was frequently a factor, especially in upstate prisons where almost all of the corrections officers are white. Eighty-two percent of New York’s prison population is black or Latino. Malik Sheppard, a soft-spoken African-American man, spent nine years in continuous solitary confinement out of a total prison term of fifteen years. Sheppard started running with the Bloods in Queens when he was barely in his teens and, at 17, was arrested for armed robbery. Like all other 16- and 17-year-olds accused of felonies in New York, he was tried in an adult court and sent to an adult prison. Concern has grown in recent years over the number of prisoners with psychological problems who end up in the SHU. A 2003 report by the Correctional Association found that while inmates diagnosed with mental illness made up 11 percent of New York’s overall prison population, they constituted nearly a quarter of the inmates in lockdown. Many of the SHU prisoners interviewed were described as “actively psychotic, manic, paranoid or seemingly overmedicated.” In New York, throwing urine or feces at a prison employee—behavior that is not uncommon among mentally ill prisoners in solitary—has been made a felony. Other symptoms of mental illness have been criminalized as well. As a result, a prisoner like Adam Hall—an Attica inmate whose initial sentence was one to three years—could spend up to a decade behind bars because of his mental illness. Hall grew up outside Utica; when he was 5 years old, he set his apartment on fire and then drew pictures of his family reuniting in heaven. Hall’s mother says that he spent much of his childhood in psychiatric facilities and juvenile homes and was sexually abused in two of them. After a series of run-ins with the law, at 22 he was convicted of assault after stealing a friend’s car and resisting arrest. The Poughkeepsie Journal’s Mary Beth Pfeiffer studied prison suicides in New York and found that, in a three-year period between 2007 and 2010, inmates in the Box killed themselves at a rate five times higher per capita than those in the general population. Some of the prisoners who took their own lives were serving long terms in solitary, while others had been in the Box for as little as one week. “I’ve cut my share of them down,” says the former corrections officer who spent years guarding the SHU. In one instance, “we cut a guy down and resuscitated him, and then he assaulted us because he was upset that we’d saved his life.” Another prisoner, he says, repeatedly attempted suicide by jumping off his bunk head first onto the concrete floor. “I still have my own nightmares about the SHU,” he adds. The hearing also featured Christopher Epps, commissioner of the Mississippi Department of Corrections, whose reduction of solitary confinement in his state (largely under pressure from the ACLU) won national acclaim. The few states that have reduced their SHU populations—some by as much as 75 percent—have seen drops in both prison violence and, ultimately, prison costs. In New York, reform has been modest and hard-won. In 2002, advocates started an effort to ban mentally ill inmates from being placed in the SHUs. Family members and former inmates joined a coalition of activists to form Mental Health Alternatives to Solitary Confinement, which organized a “Boot the SHU” campaign. “We held marches and press conferences,” says Leah Gitter, the godmother of a former SHU prisoner named Robert Pena. “We did street theater in Albany—we had a funeral march, referring to suicides in the SHU.” They also baked “the loaf” and handed it out to state senators. If New York was serious about reducing the population of inmates in isolation, those with mental illness could be moved from the SHUs into secure psychiatric facilities, which could conceivably take the place of costly supermax prisons. Prisoners who test positive for drugs could be sent to drug-treatment programs (which currently have long waiting lists). Other offenses could be dealt with through positive incentives or by terms in segregation that are brief, limited and free of extreme isolation. All of this would take political will to implement, and something more: a shift in public sentiment toward the view that prisoners are human beings, and thus entitled to immunity from torture by the state. In 2010 the American Bar Association created a set of Standards on Treatment of Prisoners, including those in segregation. But enforcing such standards would require prison practices—as well as the politics that shape them—to be driven by a genuine interest in safety, rather than a thirst for the harshest punishments possible. In the meantime, men like Billy Blake will continue to be used to justify solitary confinement. In 1987, while in county court on a drug charge, Blake, then 23, grabbed a gun from a sheriff’s deputy and, in a failed escape attempt, murdered one deputy and wounded another. As a cop-killer and an escape risk, Blake is considered a permanent threat to prison safety. For this reason, he is one of the few New York prisoners in “administrative” rather than “disciplinary” segregation—meaning he’s in solitary more or less indefinitely, despite periodic pro forma reviews of his status. He has been in isolation in a series of prisons for close to twenty-five years. He is now 48; since his sentence is seventy-seven years to life, he has no prospect of getting out of prison, and next to none of ever leaving solitary. We visited Blake in December at the Elmira Correctional Facility, a dreary building on a hill near the edge of town. After being signed in and searched, we stopped at the vending machines to buy what he had requested in a letter: Dr. Pepper and a pizza roll. (The machine was out, so we got a grayish-looking cheese steak instead.) We then waited in a special SHU visiting room, watched over by a guard. We do not know whether the man we met is too dangerous to be in the general population. We do know that the treatment he is receiving from the state can only be described as torture. Blake’s subsequent letters, which run twenty-five pages or more, describe his “magic ingredient” for surviving the Box. “I’m a dreamer,” he says, “who refuses to accept that my dreams won’t all come true, somehow…eventually.” Dreaming is what helps him get through the long, colorless nights in the SHU. “Sometimes I watch the roaches and I envy them,” he writes. Jean CasellaJean Casella edits Solitary Watch (solitarywatch.com), with James Ridgeway. She is a 2012 Soros Justice Media Fellow and also writes frequently about criminal justice issues for Mother Jones. James RidgewayJames Ridgeway edits Solitary Watch (solitarywatch.com), with Jean Casella. He is a 2012 Soros Justice Media Fellow and also writes frequently about criminal justice issues for Mother Jones.